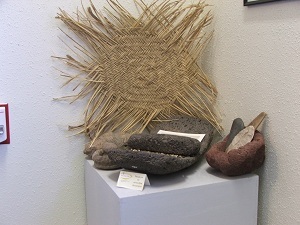 While visiting the San Luis Valley, don’t miss the Luther Bean Museum located on the second floor of Richardson Hall on the Adams State College Campus. The hours of the museum are 9 a.m. – 2 p.m. Tuesday through Friday. It is free admission but donations are appreciated. The Luther Bean Museum does allow you to take pictures, but you can’t use a flash. My (Debbie) visit to the museum included meeting Linda, one of the people that work at the museum. She was visiting with a couple from Arkansas who had also stopped to see the museum. The Luther Bean Museum was named for Mr. Bean who was born on March 5, 1887 and died on March 5, 1976. He worked for Adams State College from 1925-1950 and was very influential in the community as well as the college. The museum was Adams State College’s first library. The setting of the museum is beautiful. A large mural depicts how the Sangre De Cristo Mountain Range was named. Linda also told us the story to make the mural easier to understand. The Sangre de Cristo mountain range is the mountains on the east side of the San Luis Valley. It was told that Spaniards owned mines above the Great Sand Dunes and used Native Americans as slaves. The slaves revolted causing the Spaniards to flee the area. As they escaped across one of the two lakes, known as the San Luis Lakes, the sun was setting on the Sangre de Cristo peaks. One of the Spaniards expressed the name, Sangre de Cristo, which means blood of Christ and the name stuck. Today when the sun sets the mountains turn the same colors of red. I encourage you to take the time to watch the sun set and look back east across the San Luis Valley to the Sangre de Cristo mountain range. In nearly every area of the museum there are bronze sculptures from the well known artist, William (Bill) Moyers. Mr. Moyers was an Adams State College 1939 alumni. The museum recently increased its collection of Mr. Moyers items with the donation of sketches and children’s book illustrated by him. Mr. Moyers received the American Artists Award in 1945. He was named Adams State Outstanding Alumnus in 1963 and 1992. I enjoyed looking at the bronze sculptures as the detail is just amazing—as though the sculptures will come alive at any time. Also on display at the museum is a wonderful collection of pottery including that of Maria “Marie” Martinez, Acoma, and Santa Domingo Pueblos. 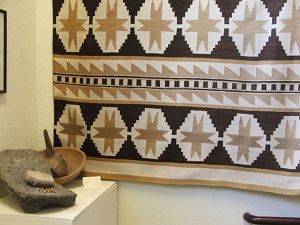 There are Native American rugs, pottery/baskets (including that of the Anasazi, Zuni, Apache, and Mohave), bead work, and an arrowhead display. There is wonderful antique furniture, porcelain figurines, ivory and sandstone figurines, and a display about Colorado Governor and Adams State College’s founder, William H. “Billy” Adams. 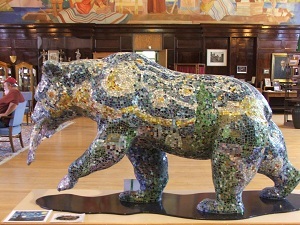 And finally in the middle of the room is a beautiful mosaic grizzly bear. You will see many of these bears around Alamosa as they were once auctioned for a fund raiser. Adams State College mascot is the Grizzly bear. 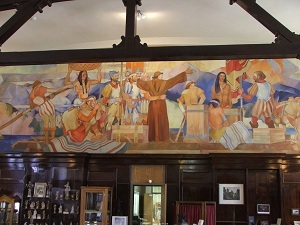 Don’t miss this museum; the mural and the woodwork in the room are well worth it!